Just south of Grand Junction, Colorado is a slickrock wilderness that is a snapshot of what much of southern Utah is like. This place is filled with monoliths, red-walled canyons, and scrub-topped mesas and plateaus. 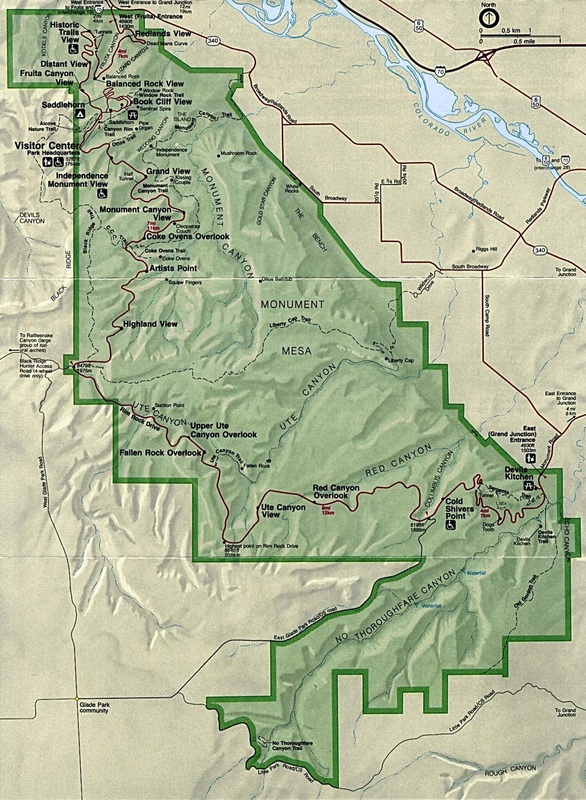 Although it is very popular with local residents, it does not seem to attract that much attention from others, perhaps because it is not a national park and because Grand Junction is not a major travel city. 23-mile Rim Rock Drive twists, turns, and climbs through the monument, yielding far-ranging vistas of the canyon country, the Grand Valley, and the Book Cliffs. Desert wildlife abounds, and those keen on raptors may be delighted. Golden eagles are also commonly seen here. Colorado National Monument is high desert country, which means that although it can be scorching hot in the summer, winters can be very cold. Aridity is what the seasons have in common, though snow sometimes graces the sandstone and late summer sees a lot of thunderstorms. We have engineer John Otto to thank for the preservation of this landscape. Starting in 1907, Otto lived alone out in this country and loved it so much that he led the charge to protect the place as a national park. Inspired by him, many citizens of Grand Junction wrote letters to Washington urging the creation of the park. Otto also built trails out here so others could enjoy the natural beauty. In 1911, Colorado National Monument was established, and Otto became the park's caretaker and did that job for 16 years, earning only $1 a month, for it was really a labor of love. Today, most of the visitors will drive the scenic drive along the rim of the park which is very scenic indeed. The drive begins in Grand Junction and climbs up to the rims above and weaves its way to Fruita. The most popular tower for climbers is Independence Monument which is a chopped route by Otto himself. This historic route would be an abomination if the same tactics were done today, but since Otto drilled the holes and installed the metal rods on the tower in the 1910's, it is regarded as a historic route. His work makes the tower a feasible climb for most climbers on what would otherwise be an aid climb by any route.